S M Ong: No holiday in DPRK: Who exactly is MFA's North Korea travel advisory for? No holiday in DPRK: Who exactly is MFA's North Korea travel advisory for? Isn’t this kind of redundant? It’s like issuing an advisory to avoid all non-essential travel to Florida, given Hurricane Irma. Or an advisory for coulrophobia sufferers to avoid all non-essential viewing of the movie It, given killer clown. I mean, even before the “recent developments” — which is just MFA’s calmer way of saying “Kim Jong Un has the hydrogen bomb and we’re all going to die!” — did many Singaporeans travel to North Korea in the first place? I believe many, many more Singaporeans visit South Korea. So MFA should really be advising against all non-essential travel to the land of Gangnam Style because if Supreme Leader Kim starts nuking people, the first to go would likely be his US-allied southern neighbour. But even without the threat of a nuclear apocalypse, there are other reasons North Korea is no longer the irresistible tourist destination it used to be. The Wonsan Air Show was supposed to be held this month but was grounded. The month-long Taedonggang Beer Festival, which was supposed to held last month, was also cancelled. It was North Korea’s answer to Oktoberfest — but in August and with fewer lederhosen. North Korea tourism has also been hampered by the lack of a promotional campaign with the slogan “Passion made possible”. Pyongyang could probably use a Formula One night race more than we do. But judging by its missile tests, North Korea seems less interested in getting the people of the world to visit than bombing it to Kim-dom come. So with North Korea being an unlikely holiday getaway for Singaporeans, who exactly is the MFA advisory for? It could be for someone like Mr Aram Pan. The Singaporean photographer was in the news recently after he posted a 6½-minute video called Flight Over Pyongyang on YouTube on Sept 2. Showing aerial footage of Pyongyang shot last year, the video was featured on several foreign news sites last week. Metro.co.uk said the footage reveals “a city full of skyscrapers but streets largely empty of cars and people”. 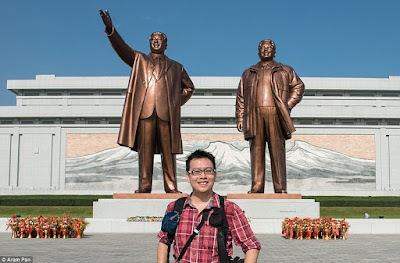 He has been uploading videos shot in North Korea to his YouTube channel since 2013 and has a website called DPRK 360, dedicated to the country. Mr Pan sounds like someone who does a lot of “non-essential travel” to North Korea. I e-mailed him yesterday and asked whether he is affected by MFA’s advisory. Of course, the advisory could also be meant for me. The last place I had a haircut was in North Korea last year when I was there for the Pyongyang marathon. I swore never to have my hair cut again because I want to be able to say forever that the last place I had a haircut was in North Korea. In the intervening 17 months, my hair has grown long and unsightly. My family and co-workers are begging me to cut it. And frankly, I, too, am getting annoyed by my own hair. I figured the only way I could cut my hair and still be able to say that the last place I had a haircut was in North Korea was to actually return to North Korea to get another haircut. Then came the travel advisory. I think going to Pyongyang for a trim counts as “non-essential travel”. Looks like I’ll be cosplaying as Kylo Ren for the release of Star Wars: The Last Jedi in December after all. Thanks a lot, MFA. Look what you made do.